It is daunting to think about myself as my children’s “first teacher.” Thinking about all we have to teach our children, as parents, is overwhelming. On top of teaching them proper manners, how to dress themselves, and our families’ values, we also need to support their reading at home. “What Not to Say” states that parents should not interrupt their children to correct a mistake. There are many times my kids overlook a word or say the wrong word when reading. The article shares how parents should let the mistake go, unless it interferes with the meaning of the text. For example, if your child says “the” for “a” or “mother” for “mom,” the meaning of the text remains the same. This is something I will have to work on as a listener. I want to make sure my kids are reading with accuracy, but understand how it could be frustrating to be interrupted and could decrease their motivation to read. If the mistake does interfere with meaning, they suggest you wait until the end of the page and ask your child if it makes sense. Instead of interrupting, have your children reread a book to help them get better accuracy. Children read at different paces. Emerging readers tend to read fairly slowly, which can be frustrating for busy parents. Instead of asking children to speed up or slow down their reading, parents can demonstrate how to read fluently, with appropriate speed and intonation. Parents can model this by making their read alouds sound like talking, or conversation. Day 1: Your child will read the book aloud to you. Day 2: Have your child read it again. Next, read the book with him/her by using the “echo reading” technique. Read a page and have your child read the same page after you. Having your child track their reading with their finger is helpful in order to accurately read the text. Day 3: Read the book together in unison—this will help your child learn proper phrasing. Day 4: You read the book. Then, he/she reads it to you. Day 5: This is your child’s chance to shine. Have your child read the book aloud to you or another family member. He/she can even read on a voice recorder app or online to a family member. Reading the same book over and over will allow your child the chance to practice reading fluency, which means they will read at an appropriate rate, with accuracy, and with expression. Griffin and I tried this and by day 5 I noticed a huge difference in Griffin’s reading. In his first attempt at the book he read slowly and it didn’t sound like conversation. By day 5, he was reading confidently and his reading sounded like talk. We will not do this activity with every book we read, but it is nice to practice fluency in this way every now and then. Sometimes emerging readers pronounce a word in a funny way or make silly errors. It is very tempting to laugh, but the article states that you shouldn’t. Laughing could embarrass your child or make him nervous. If your child thinks something he/she did is funny, then you can laugh together. Instead of telling them what they should know, parents can help children figure it out. If your child isn’t able to read a word, you can help them by breaking it into parts that might be familiar. For example, if your child is stumped at the word “thick,” you could have him tell you what “ick” says and then have him try to put the “th” with the “ick”. This evening, when Ryan and I were working on a sight word app, I accidentally said exactly what the article says not to say. She came across the word “this” which is one of her class sight words, but she was having trouble remembering it. At first I said, “You should know this one, “ but then I thought about the article and changed it to, “Remember that we put that one on the wall when you brought it home and it looks like another sight word you’ve already learned (his)?” After that she was able to figure it out without any added pressure. When your child stumbles on a word he doesn’t know, it is best to give him time to try it for himself. This allows a child the opportunity to become an independent reader. This video has suggestions for how parents can help their children figure out unknown words. I recommend you should search “What Not to Say” in the IRRC Family Resources Collection to read more about how to best support your child when listening to him/her read. 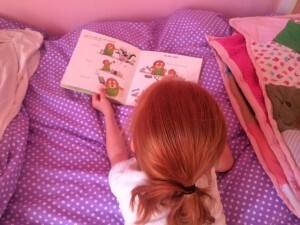 This article is very helpful and can help your child become a confident, independent reader.